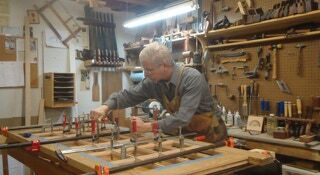 The House Carpenter is Tony Cerrito, a woodworking and carpentry professional. As a local small business, Tony serves all areas from Sewell to Cherry Hill. Tony provides complete service, from design drawings to fabrication and installation, taking whatever time is necessary to complete all phases of the project to get the design and the details right. The House Carpenter can build or restore nearly everything of wood to fulfill your wishes, whether the work is interior, exterior, new or renovation. From the restoration of rotting or water damaged wood to additions to your home such as staircases, decks, and fabricated cabinetry, why settle for a standard, production-grade home when you can have charming, customized features? My goal is to make my clients not just satisfied but to exceed their expectations. View a sample gallery of successful projects from across the region including Haddonfield, Voorhees, Marlton, Blackwood, Moorestown, and Woodbury.